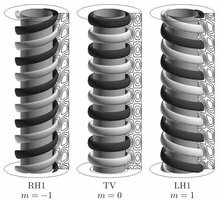 The effect of eccentricity on absolute instabilities (AI) in the Taylor–Couette system with pressure-driven axial flow and fixed outer cylinder is investigated. Five modes of instability are considered, characterized by a pseudo-angular order $m$ , with here $|m|\le2$. These modes correspond to toroidal ($m=0$) and helical structures ($m\not=0$) deformed by the eccentricity. Throughout the parameter range, the mode with the largest absolute growth rate is always the Taylor-like vortex flow corresponding to $m=0$. Axial advection, characterized by a Reynolds number $Re_z$ , carries perturbations downstream, and has a strong stabilizing effect on AI. On the other hand, the effect of the eccentricity $e$ is complex : increasing e generally delays AI, except for a range of moderate eccentricites $0.3\lesssim e\lesssim0.6$, where it favours AI for large enough Rez . This striking behaviour is in contrast with temporal instability, always inhibited by eccentricity, and where left-handed helical modes of increasing $\vert m\vert$ dominate for larger $Re_z$. The instability mechanism of AI is clearly centrifugal, even for the larger values of Rez considered, as indicated by an energy analysis. For large enough $Re_z$, critical modes localize in the wide gap for low $e$, but their energy distribution is shifted towards the diverging section of the annulus for moderate $e$. For highly eccentric geometries, AI are controlled by the minimal annular clearance, and the critical modes are confined to the vicinity of the inner cylinder. Untangling the AI properties of each m requires consideration of multiple pinch points.